Abstract. Today's geodynamic models can, often do and sometimes have to become very complex. Their underlying, increasingly elaborate numerical codes produce a growing amount of raw data. Post-processing such data is therefore becoming more and more important, but also more challenging and time-consuming. In addition, visualising processed data and results has, in times of coloured figures and a wealth of half-scientific software, become one of the weakest pillars of science, widely mistreated and ignored. Efficient and automated geodynamic diagnostics and sensible scientific visualisation preventing common pitfalls is thus more important than ever. Here, a collection of numerous diagnostics for plate tectonics and mantle dynamics is provided and a case for truly scientific visualisation is made. Amongst other diagnostics are a most accurate and robust plate-boundary identification, slab-polarity recognition, plate-bending derivation, surface-topography component splitting and mantle-plume detection. Thanks to powerful image processing tools and other elaborate algorithms, these and many other insightful diagnostics are conveniently derived from only a subset of the most basic parameter fields. A brand new set of scientific quality, perceptually uniform colour maps including devon, davos, oslo and broc is introduced and made freely available (http://www.fabiocrameri.ch/colourmaps, last access: 25 June 2018). These novel colour maps bring a significant advantage over misleading, non-scientific colour maps like rainbow, which is shown to introduce a visual error to the underlying data of up to 7.5%. 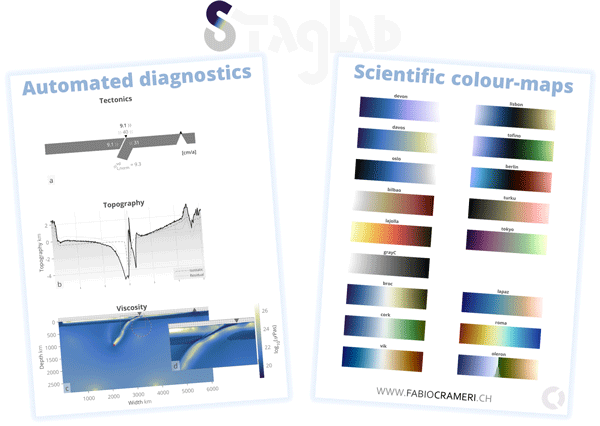 Finally, StagLab (http://www.fabiocrameri.ch/StagLab, last access: 25 June 2018) is introduced, a software package that incorporates the whole suite of automated geodynamic diagnostics and, on top of that, applies state-of-the-art scientific visualisation to produce publication-ready figures and movies, all in the blink of an eye and all fully reproducible. 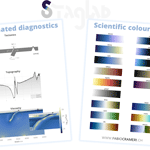 StagLab, a simple, flexible, efficient and reliable tool made freely available to everyone, is written in MATLAB and adjustable for use with geodynamic mantle convection codes. How to cite: Crameri, F.: Geodynamic diagnostics, scientific visualisation and StagLab 3.0, Geosci. Model Dev., 11, 2541-2562, https://doi.org/10.5194/gmd-11-2541-2018, 2018.